One of my life goals has always been to move to the beach. I am beach person. There is something about the ocean that soothes my soul, calms my anxiety and gives me so much joy. I’m lucky to live less than 4 hours from the coast of North Carolina and to have been able to vacation at the beach many times during my life. Last year I started researching and looking at condos to rent or buy. Due to some health issues I have been dealing with, I decided to delay my plans to move. One of the largest hurricanes in 30 years (Florence) is about to hit the NC coast and almost directly make landfall at my favorite NC beach. Several people have told me this week “I bet you are glad you didn’t move yet!” and “this is why I would never want to live at the beach or be too scared to move there”. I started thinking about why people still want to live at the beach even though they know there are hurricanes that will come every single year that can/will cause damage and every 30ish years one will come that’s big enough to completely destroy everything in it’s path. People will go back to the beach, rebuild, & more will continue to go and live there & rebuild if necessary for years to come. It doesn’t scare me away from wanting to live there either. It’s the same for anyone who owns their own business. We have to risk fear, rejection, failure, ridicule, mistakes, being visible, judgement and more as CEO of Me’s. The rewards of being self employed are freedom, flexibility in your schedule, unlimited income potential, living the life of your dreams, helping others, achieving goals and so much more. 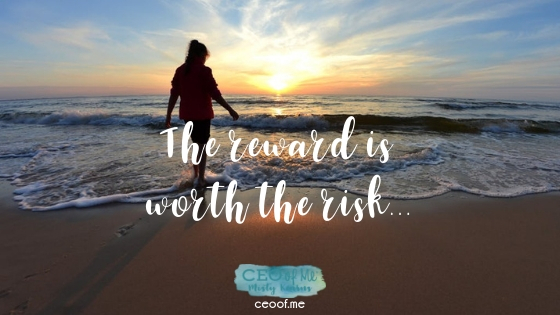 The rewards are worth the risk. Being a CEO of Me is not easy most of the time. I have faced many “hurricanes” in my life and business in the past 12 years. I want to completely throw in the towel at least one day a week every week. I question if what I’m doing matters. I want to blame someone or something else when things go wrong. I really would like to feel sorry for myself sometimes. There are days where I feel like other people have it easier than me. I feel completely alone sometimes. I mess up & make mistakes a lot of times. I don’t reach most of my goals. I get off track sometimes. But I keep going. I keep facing the storms. I keep rebuilding after each “hurricane”. I stay focused on the bigger picture & all the good n my life. I keep risking because the reward is worth it! The most important work you will ever do, what will set you up on a foundation that can withstand the storms of life & business is the work you do on yourself and the time you invest in your own personal development. It’s never -ending work. You will continually have to patch up holes, fix broken windows and sometimes rebuild completely. You will always have the threat of the hurricanes known as mistakes, rejection, failure & fear… but on the other side of those risks are your DREAMS, HAPPINESS, JOY & a FULFILLING LIFE! Are you willing to take the risk, to weather the storms, to become strong enough to endure the tough times so you can enjoy the rewards the rest of time? One day, one hour, one minute, one step, one thought, one action, one reaction at a time is how it’s done. PS. Be sure to check out my Best Life & Business Planning Course before you go! You can get access to the first video & workbook section on Mindset, Confidence, Overcoming Fear & Taking Action Towards Your Goals for FREE!